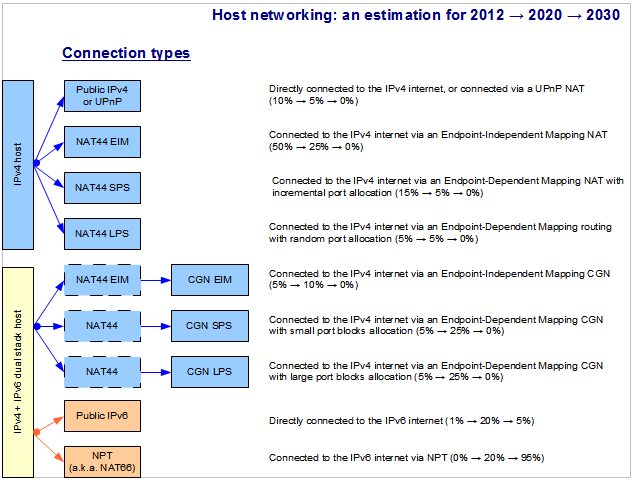 After getting some fresh air a couple of weeks ago, i started to think about what kind of internet connection types are to be expected during the IPv4-to-IPv6 transition period (based on this year's developments and apparent trends in IPv6 and IPv4 CGN deployments), about how long this transition period might be, and then i pondered if/how can this transition period be accommodated by a pure P2P network topology. This post is about what i came up with. 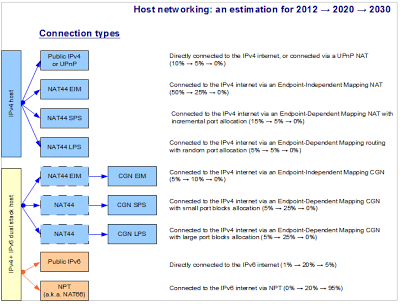 First, the time frame: i divided the transition period into a first stage 2012 -> 2020 during which the adoption of IPv6 will increase to reach some 40% market share, while in parallel most IPv6 deployments will be accompanied by either a legacy routable IPv4 address or by a new private IPv4 address delivered by the ISP via CGN (note: it is possible, even likely, that mobile IPv6 internet connectivity will lag the cable IPv6 deployments, such that only private IPv4 CGN-based connectivity will be provided on mobile networks for quite a few years to come); then, a second stage of the IPv6 transition i guesstimated it to span the 2020 -> 2030 time frame, during which IPv6 will incrementally become the norm, while routable IPv4 will most likely almost disappear, and also private CGN-based IPv4 addresses might be phased out. In order to analyze how two given hosts can establish a P2P connection given the transition scenario described in the diagram above, we will consider all the possible variants for a pair of hosts with one host being the connection initiator and the other host being the responder. Based on this convention, the diagrams that follow in this post will specify how a P2P connection can be made depending on the type of connection that each of the two hosts has to the internet. And now let us look at all the possible P2P connection variants, grouped into "connection classes" diagrams. A second class of IPv4 connections is illustrated in the diagram below, where the types of [IPv4] connections that the initiator and responder have to the internet require the assistance of a third peer for relaying their communications, with said third-party relaying peer being connected to the internet via an Endpoint-Independent Mapping [IPv4] NAT router. 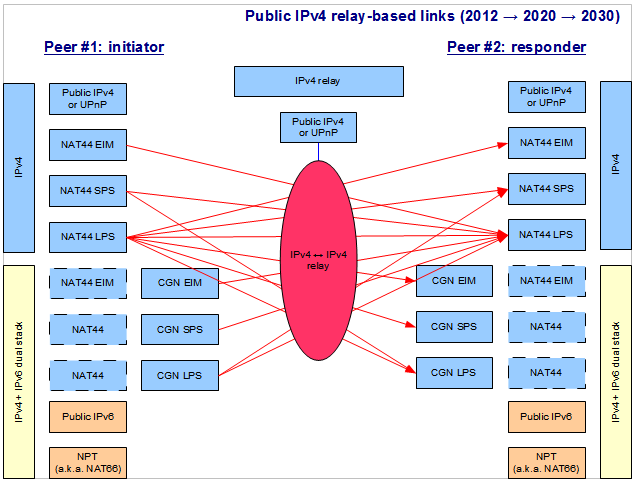 as it is obvious from the diagram above, once the transition to IPv6 will be completed, all P2P connections will be feasible as direct IPv6 connections, i.e. they will not require a third-party peer for relaying the P2P communication. 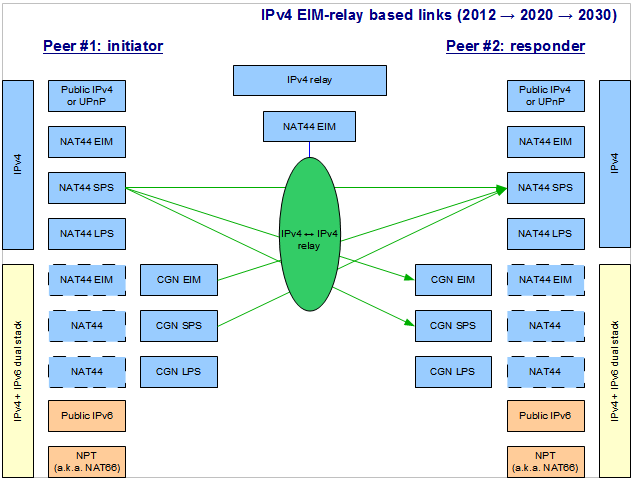 In conclusion, now that i'm done with this deluge of diagrams and geeky explanations, here's my 2 cents in a nutshell: should the IPv6 and CGN deployments stay the right course, and, sure enough, if i'm not missing some show-stopper somethin' somethin', the point to take home from this post is that it currently seems the tide has turned from exactly one year ago and P2P networking now seems feasible for both during, and after, the IPv4-to-IPv6 transition period, with the caveat that some serious challenges still exist, mostly related to how IPv6 and CGNs will be deployed on the 3G/4G mobile networks, and i don't yet have sufficient data to guesstimate how serious said challenges are.